This proud-looking bird is right at home on the sagebrush range. But there are big problems here. Can people solve them? It’s worth a try! The bird above is looking proud for a reason. It’s a male greater sage-grouse, giving his best performance to attract a mate. And what female sage-grouse wouldn’t be impressed by his fanned-out tail, flexed wings, and puffed-up chest? But this fancy, chicken-like bird doesn’t know that his habitat in the western plains (see map) needs help. It’s disappearing—and so are the sage-grouse. The habitat is a kind of grassland called the sagebrush steppe. It’s a landscape covered mostly with sagebrush, a low-growing, grayish-green shrub. 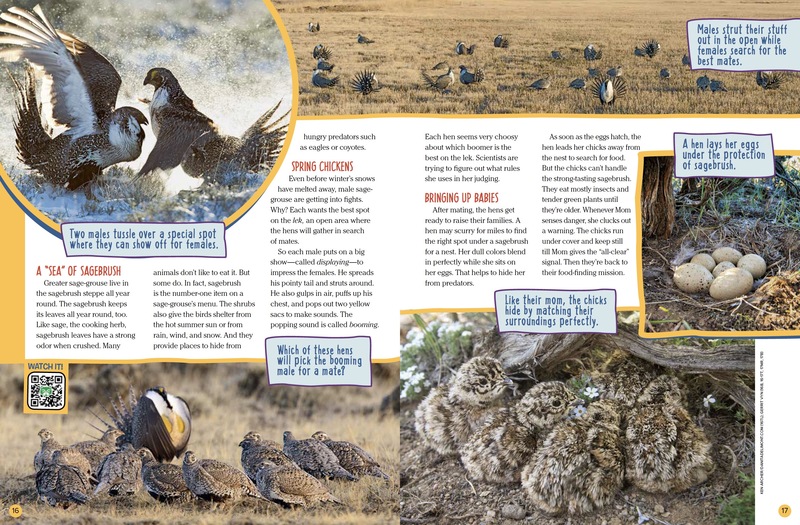 Read on to find out about the life of a sage-grouse and the troubles it faces. Greater sage-grouse live in the sagebrush steppe all year round. The sagebrush keeps its leaves all year round, too. Like sage, the cooking herb, sagebrush leaves have a strong odor when crushed. Many animals don’t like to eat it. But some do. In fact, sagebrush is the number-one item on a sage-grouse’s menu. The shrubs also give the birds shelter from the hot summer sun or from rain, wind, and snow. And they provide places to hide from hungry predators such as eagles or coyotes. Even before winter’s snows have melted away, male sage-grouse are getting into fights. Why? Each wants the best spot on the lek, an open area where the hens will gather in search of mates. So each male puts on a big show—called displaying—to impress the females. He spreads his pointy tail and struts around. He also gulps in air, puffs up his chest, and pops out two yellow sacs to make sounds. The popping sound is called booming. Each hen seems very choosy about which boomer is the best on the lek. Scientists are trying to figure out what rules she uses in her judging. After mating, the hens get ready to raise their families. A hen may scurry for miles to find the right spot under a sagebrush for a nest. Her dull colors blend in perfectly while she sits on her eggs. That helps to hide her from predators. As soon as the eggs hatch, the hen leads her chicks away from the nest to search for food. But the chicks can’t handle the strong-tasting sagebrush. They eat mostly insects and tender green plants until they’re older. Whenever Mom senses danger, she clucks out a warning. The chicks run under cover and keep still till Mom gives the “all-clear” signal. Then they’re back to their food-finding mission. There aren’t nearly as many greater sage-grouse as there once were. And that’s mostly because there’s a lot less sagebrush than there once was. Much has been cleared for farms, towns, and roads. Grazing cattle can change the landscape. Companies drilling for fuel or mining minerals can, too—plus, they build more roads. They also put up drilling-rig towers and utility poles where hawks and eagles can perch and watch for sage-grouse to attack. And, because sage-grouse don’t fly high, they often get caught on barbed-wire fences or hit by cars or trucks. Many people decided to work together on solutions. Now, for example, there are road signs warning drivers about crossing birds and colored tags guiding the birds over fences. Plus, many landowners have agreed to preserve sagebrush where it still exists and to restore it in places where it has been damaged. If things work out as planned, the greater sage-grouse will continue to survive. And so will all the other animals that depend on the sagebrush steppe. With its fancy dance and special sound, the greater sage-grouse is a star on the sagebrush stage. But there are many other wild characters out there. 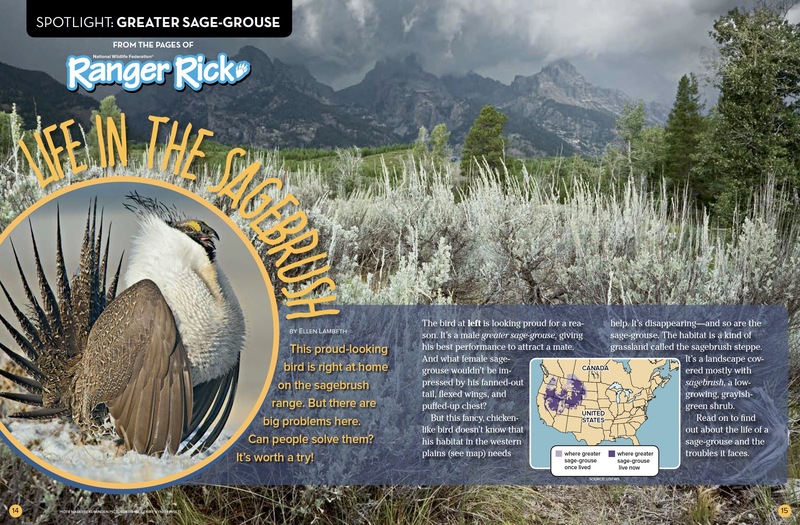 They all depend on the sagebrush habitat—and, like the sage-grouse, some can survive nowhere else. Meet just a few here. Out on the steppe, an American badger (1) may pop up from its burrow to hunt small mammals and lizards. So the world’s tiniest bunny, the sage-nibbling pygmy rabbit (2), and basking reptiles such as the greater short-horned lizard (3) must stay alert. The sage thrasher (4) relies on sagebrush for nesting, while herds of pronghorn (5), elk, and mule deer all depend on it for food. 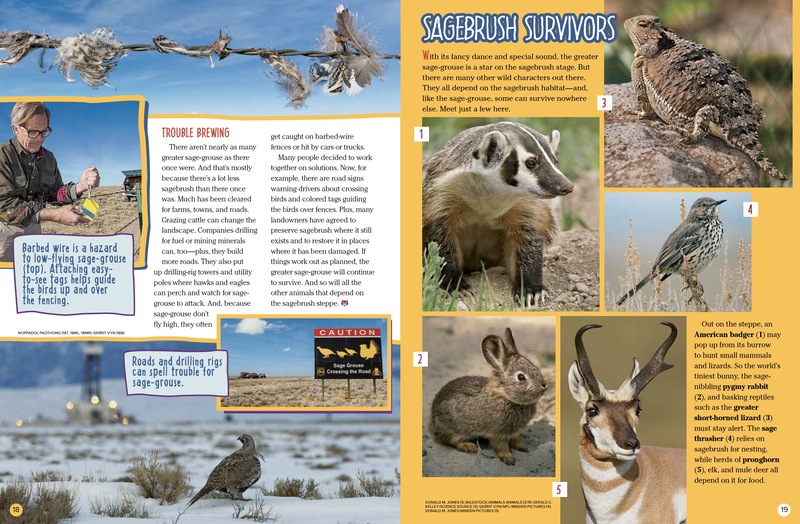 “Life in the Sagebrush” originally appeared in the April 2017 issue of Ranger Rick magazine.